Three of the most popular movie musicals of the 1980s, Flashdance (1983), Footloose (1984), and Dirty Dancing (1987) have been adapted for the stage but only one of them ever made it to Broadway. Footloose opened at the Richard Rodgers Theatre on October 1998 and ran for almost two years. Love means never having to say you’re sorry. Famous line from the 1970 hit movie Love Story which starred Ali MacGraw and Ryan O’Neal (pictured above). Now both stars are back together and touring the country in Buffalonian A.R. Gurney’s epistolary play, Love Letters. The show will play 710 Main Theatre, May 11th-22nd. Both stars also celebrated their birthdays in April. McGraw turned 77 on April 1st, O’Neal turned 75 on April 20th. Gurney’s play was revived on Broadway in 2014 where it had a short run and closed before four of the announced stars (Anjelica Huston, Stacy Keach, Diana Rigg and Martin Sheen) of its rotating cast were able to take their turn. Three of the most popular movie musicals of the 1980s, Flashdance (1983), Footloose (1984), and Dirty Dancing (1987) have been adapted for the stage but only one of them ever made it to Broadway. Footloose opened at the Richard Rodgers Theatre on October 1998 and ran for almost two years. The other two have been touring the country and abroad over the past few years. Flashdance actually made a stop at Shea’s last November. Now, it’s Dirty Dancing’s turn, on stage at Shea’s May 3rd-8th. The show first opened in Australia in 2004 and was subsequently produced in the UK, Europe, Canada, and the US. This new touring production stars Christopher Tierney as Johnny, the dance instructor. Tierney was in the original Broadway cast of Spiderman: Turn Off The Dark. He made national news when, during previews, he fell 30 feet from a ledge during one of the show’s flying stunts, breaking fifteen bones. He returned to the show after four months. Following in the footsteps of Daniel Radcliffe, local actor PJ Tighe will star next season in the Irish Classical Theatre production of Peter Shaffer’s Equus. Radcliffe starred in the 2008 Broadway revival of the play. Currently, Tighe is starring in Musicalfare’s zesty production of How to Succeed in Business Without Really Trying. Radcliffe starred in the 2011 Broadway revival. By the way, up next for Radcliffe, an off-Broadway production of a new play called Privacy which explores how technology and privacy relate nowadays. For Trivia fans, Equus was last produced in Buffalo in 1991 by Theatre of Youth (yes, there used to be a TOY After Dark series!). Patrick Cameron returns to Buffalo to play the gigolo opposite Aleks Malejs as Alexandra del Lago in the Irish Classical Theatre production of Tennessee Williams’s Sweet Bird of Youth to be directed by Fortunato Pezzimenti for Curtain Up! Sweet Bird is not as frequently produced as the other Williams classics. The original 1959 Broadway production starred Geraldine Page and Paul Newman. The 1975 revival had Irene Worth and Christopher Walken. Nicole Kidman was announced to play the part in 2011. Kim Cattral starred in the 2013 London revival, where the part was originated in 1985 by Lauren Bacall. BUA and Ujima will join forces for Curtain Up! to present Jeff Talbott’s dramatic comedy The Submission. Directed by Lorna C. Hill, the production will star Shanntina Moore, Michael Seitz, and Rick Lattimer. The Jewish Repertory Theatre will devote its entire season to playwright Amy Herzog, opening with her 2013 Pulitzer Prize finalist 4000 Miles. The season will also include her plays After the Revolution and The Great God Pan. Road Less Traveled Productions will honor renowned playwright Donald Margulies as an American Theatre Master during the 2016-17 season. The company will open the season with Margulies’s 2000 Pulitzer Prize winner Dinner with Friends, directed by Katie Mallinson, starring Kelly Meg Brennan, Dave Hayes, Lisa Vitrano, and Phil Farugia. The season will conclude with Margulies’s The Country House, which played Broadway in the 2014-15 starring Blythe Danner. Directed by Scott Behrend, the local production will star Barbara Link LaRou, Peter Palmisano, Christian Brandjes, Kristen Tripp Kelley, Chris Kelly, and Renee Landrigan. 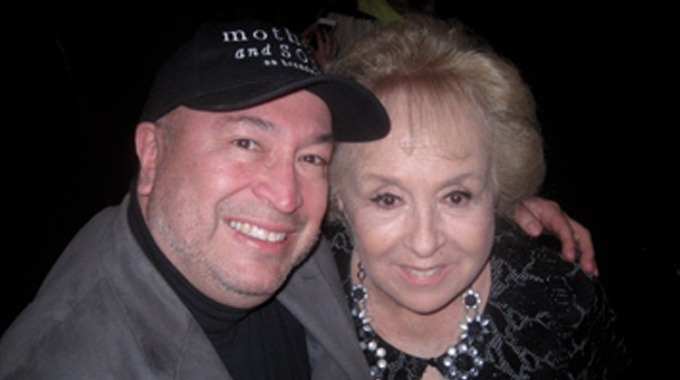 The fabulous Doris Roberts (pictured below) died of natural causes on April 17th. She was 90 years old. She appeared in several Broadway shows including Neil Simon’s The Last of the Red Hot Lovers (1970) and Terrence McNally’s Bad Habits (1974). Best known for her role in TV’s Everybody Loves Raymond, her last stage appearance was in McNally’s Unusual Acts of Devotion at LaJolla Playhouse in 2009.